Kat Johnson with one of her prints titled Catherin II that will be among her prints in her show "Oh you pretty things." The show will open March 4th at the Sohns Gallery at the Rock and Art Shop in Bangor. When artist Kat Johnson was looking to buy a house in Bangor, space for an art studio was a must-have. Art has always been a critical part of Johnson’s life. “I’ve been doing it as long as I can remember,” said Johnson, who works by day as the education and marketing manager at the University of Maine Museum of Art in downtown Bangor. 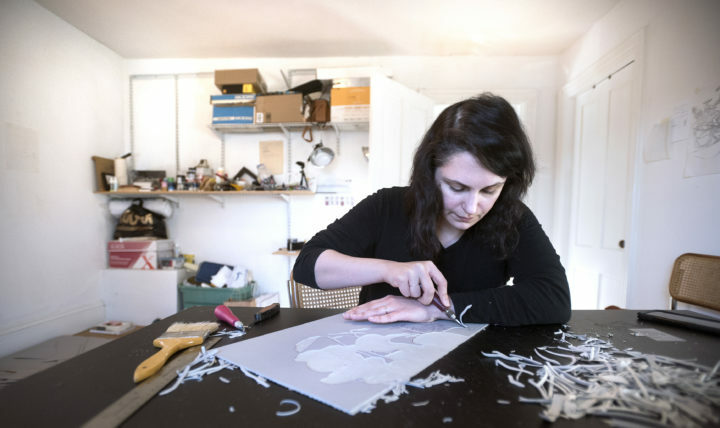 For the past six months, she has been preparing pieces for her latest exhibition, set to open Monday at The Rock and Art Shop’s Sohns Gallery in downtown Bangor. The exhibition will feature relief print work: art Johnson makes by pressing a stamp-like block onto lightweight paper, leaving behind a design. This will be Johnson’s second exhibition at the Sohns Gallery. She was the first artist to have her work featured there when the store opened in 2011. Even before The Rock and Art Shop opened, Johnson designed a 26-foot textile pattern painting to cover the shop windows. Johnson got her artistic start as an adolescent, when she started taking oil painting classes with the support of her mother, a seamstress. 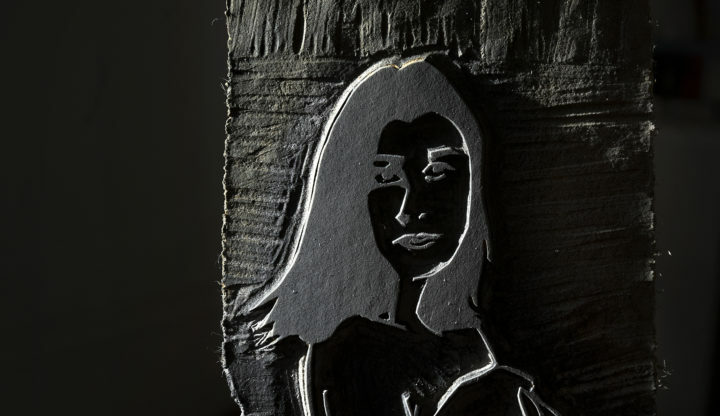 Bangor artist Kat Johnson carves a linoleum block for one of her prints. Her show "Oh you pretty things" will open March 4 at the Sohns Gallery at the Rock and Art Shop in Bangor. Johnson’s passion for art blossomed throughout high school with the help of Douglas James Maguire, an artist and teacher at Coxsackie-Athens Central High School in Coxsackie, New York — a small town south of Albany on the west bank of the Hudson River. She ended up in Maine after a brief stint at the State University of New York at Purchase. She left after the attacks of 9/11 and joined her mother, who had relocated to Blue Hill in the fall of 2002. Johnson enrolled at the University of Maine in Orono and began studying theater and fine arts. After completing her undergraduate degree in 2007, Johnson stayed at UMaine to complete a Master of Fine Arts in Intermedia degree. Working as a graduate assistant in the School of Performing Arts’ costume shop, she expanded her artistic repertoire and began creating her own designs. She worked with the costume shop manager, Lucia Williams-Young, to make costumes and animal masks for UMaine shows. During down time, Williams-Young taught Johnson how to sew. It was Johnson’s first time learning to design, draft and produce her own work through sewing. Although her mother was a seamstress, Johnson said she was not interested in learning to sew when she was younger. “She really taught me a lot,” Johnson said of Williams-Young. Years later, Johnson used her costume-making skills to help create her own wedding dress. During her artistic career, Johnson also dabbled in political art and created her own greeting cards. A linoleum block carved by Kat Johnson for one of her prints titled Catherin I. Her show "Oh you pretty things" will open March 4th at the Sohns Gallery at the Rock and Art Shop in Bangor. 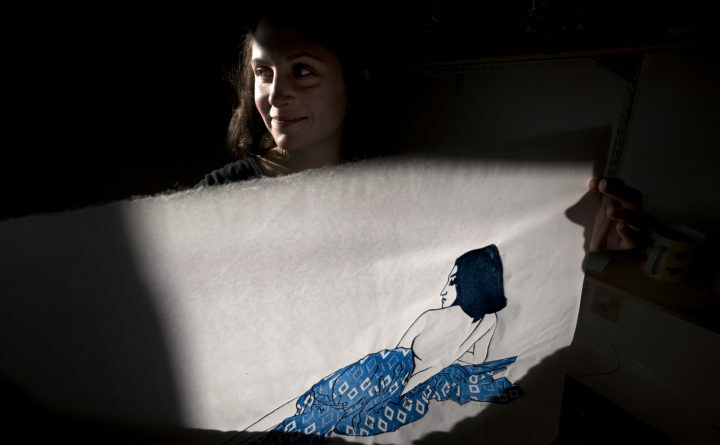 Lately, Johnson has been spending a lot of time in her home studio preparing the relief prints that will be on display at her upcoming exhibition, called “Oh You Pretty Things.” To create the prints — a fairly new medium for Johnson — she carves a design into an artist-grade linoleum mat, covers it with ink, then presses a lightweight paper — similar to tissue paper — on top to transfer the design. She repeats this process with multiple design patterns, layering pieces to make them appear three-dimensional. “Oh You Pretty Things” opens Monday at the Sohn’s Gallery, with an opening reception scheduled for Friday at 6:30 p.m. Johnson’s featured work and prints will be available for purchase. A portion of the proceeds will benefit the Mabel Wadsworth Center in Bangor.